« Will Governor Pat Quinn Sign Illinois Budget on Thursday? (Springfield, IL) — Taxpayers gave Illinois a $1.2-billion shot of cash in August, or $464 million more than last August. Personal income tax revenue jumped by 68 percent for last month when compared with the same time in 2010, almost mirroring the personal income tax increase of 67 percent approved in January, according to a report issued by the Legislature’s Commission on Government Accountability and Forecasting, or COGFA, this week. Overall, the state’s revenue jumped from $1.9 billion in August 2010 to $2.2 billion last month, an increase of 13 percent. 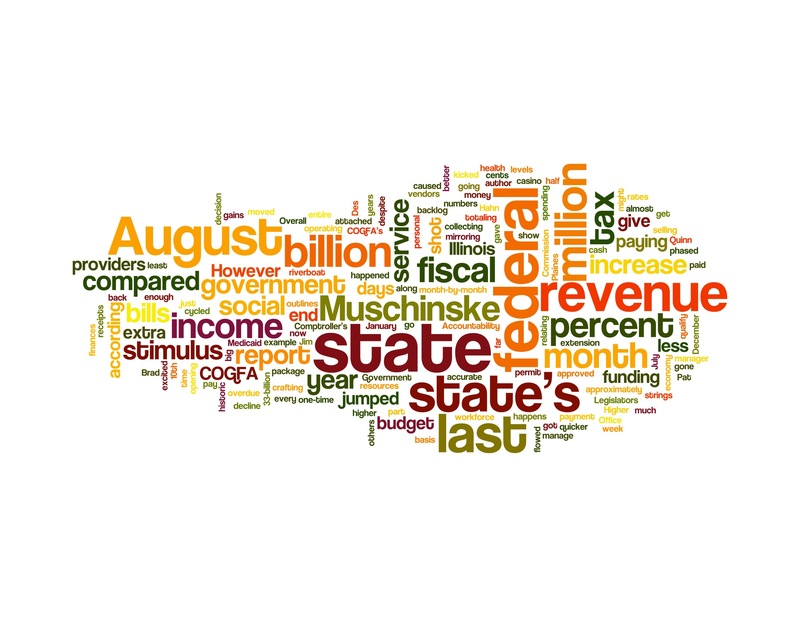 However, focusing on the month-to-month numbers won’t give an accurate picture of the state’s fiscal health, said Jim Muschinske, COGFA’s revenue manager and author of the August revenue report that outlines Illinois’ finances. “I’ve been doing this for more than 20 years, and I don’t get excited over one month. There is just too much that happens on a month-by-month basis,” Muschinske said. For example, income tax receipts from July through December, or the first half of fiscal 2012, might show big gains compared to last year. But those increases are only because of the income tax increase, and not because the state’s workforce or economy is doing better, according to the COGFA report. The state also got a one-time shot of $73 million relating to the selling of a permit for and opening of the state’s 10th riverboat casino this summer in Des Plaines. Higher revenue for August flowed in despite the state collecting less money from the federal government. The end of the federal stimulus package and the state’s extension on paying its social service vendors caused a decline of federal funding by $264 million, or 66 percent less, to $135 million last month compared with $399 million last August. For the entire fiscal year, the state will lose about $1 billion in federal funding, Muschinske said. Under the federal stimulus, for every $2 the state spent on Medicaid, the federal government kicked in $1.20. But that extra 20 cents has been phased out, along with the strings attached to it. “What happened under the stimulus plan was that the federal government said ‘we’ll give you the higher matching rates, but in order to qualify, you are going to have to pay (social service) providers in 30 days. That’s far quicker that we’ve ever paid before,” Muschinske said. “Now that the match is gone, part of the way to manage our resources was the decision to allow approximately $1 billion in bills to be pushed back and the payment cycled moved to more historic levels” of 60 to 90 days, he said. The state now has overdue bills from social service providers, schools and others totaling $3.8 billion, said Brad Hahn, spokesman for the state Comptroller Judy Baar Topinka’s Office. Legislators, when crafting the $33-billion operating budget for the state, said that any extra revenue would go toward paying off the state’s backlog of bills. However, Gov. Pat Quinn has said the budget sent to him doesn’t contain enough spending to operate at least 12 state agencies through the end of the fiscal year. This entry was posted on September 9, 2011 at 9:35 am and is filed under Illinois Budget. You can subscribe via RSS 2.0 feed to this post's comments.